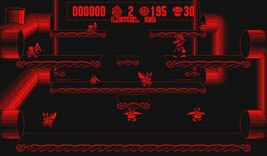 Inspired by Mario Bros., Mario has to clear enemies from the 40 levels of Clash House Tower. There are platforms in the foreground and background, and both Mario and enemies can move between them using the pipes. Jump on the Koopa Troopas to turn them into a shell. You can then use the shell to clear the spiked enemies that appear. Once you clear all the enemies, you move up to the next level of the Tower.